Pi is the ratio of a circle's circumference to its diameter, and pie is a delicious pastry. On Monday, you can celebrate the existence of both. 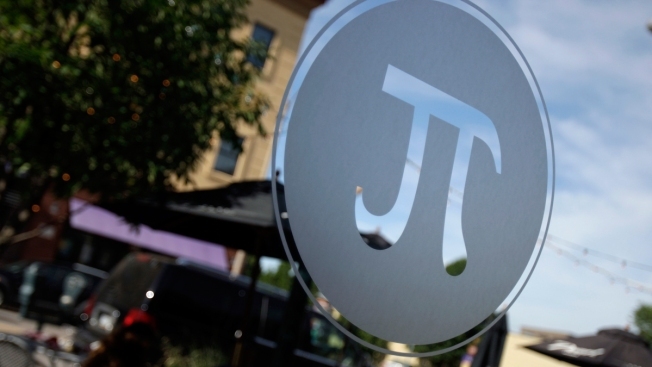 Monday is Pi Day, a celebration of the number Pi (or 3.14159), and the D.C. area is celebrating with a number of deals and freebies. &pizza will turn its new Columbia Heights location into a wedding chapel Monday. Couples will have a chance to tie the knot or renew their vows. You can grab a slice of pie for $3.14 at Bayou Bakery. If you're craving a desert after lunch or dinner, you can pick up three of its baked sweet potato pies for $3.14. Monday is Pi Day. Get at us. Are you a math whiz? Pizza Hut will give 3.14 years worth of pizza to three people who can answer three word problems written by a famous Princeton math professor. The questions will be posted online at 8 a.m. Monday. Click here for more information. Whole Foods is offering a discount on its pies and pizzas. You can get $3.14 off sweet pies, and $2 off their take and bake pizzas.